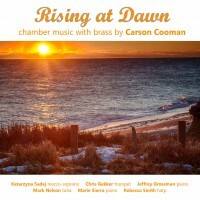 Autumn Sun Canticle was premiered by Colby Cooman, trumpet and Carson Cooman, piano on November 19, 2005 at Nazareth College, Rochester, New York—at a memorial concert celebrating the life and music of Bob Stata. This work has an autumnal spirit, but is lyrical and hopeful as well. An opening aria section leads toward a chorale-like passage. A development of this material leads towards a passionate and somewhat anguished climax. The opening aria returns, before an elegiac coda closes the work.